Our one year old lab mix is sick… again. Remember when he ate a few pairs of underwear and a sock? Well, it isn’t as bad as that time, but he is definitely sick. He has been throwing up since early Sunday morning. I took this photo with my phone at around 6am. 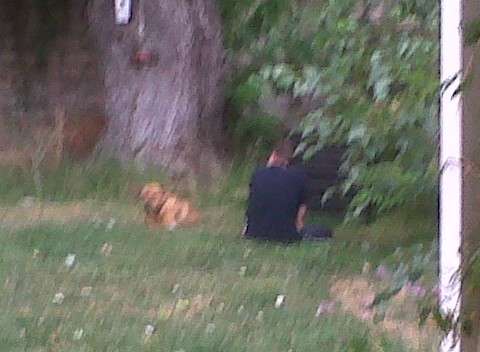 My husband is sitting in the grass next to Teddy trying to comfort him. So sweet. As we are currently quite broke, we decided to wait on taking him to the vet. It was Sunday (again) and we would be forced to go to the extremely over-priced emergency vet where they would give him fluids and say nothing was wrong (probably). I was supposed to go to a professional development (like training for teachers, but completely optional) today, but decided to stay home and keep an eye on Teddy and take him to our regular (reasonably priced) vet if needed. He slept most of the day and while I had errands to run and things to do, he followed me everywhere, so I felt bad leaving him… Which meant I laid in bed pretty much all day while he slept beside me on the floor. 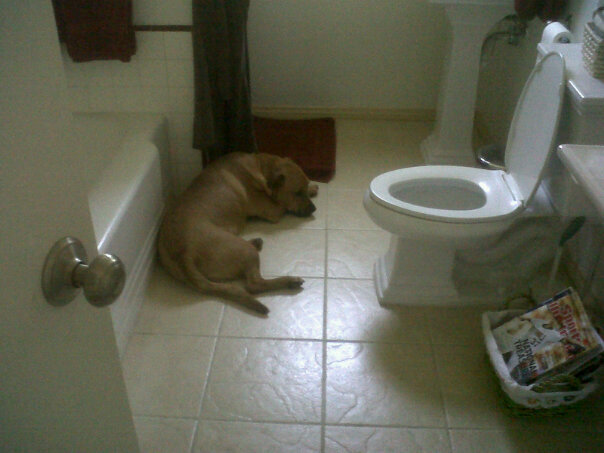 I took this after he had followed me into the bathroom and fell asleep. 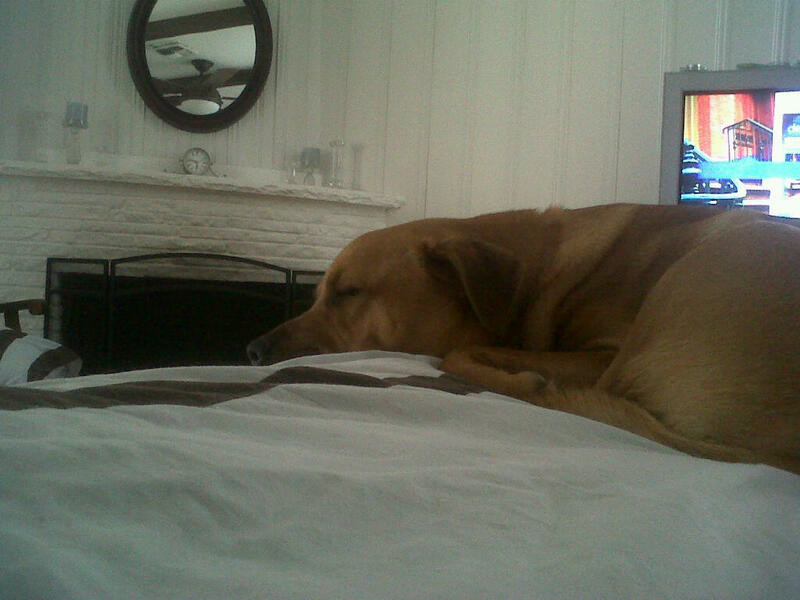 He soon came back to our room to be right by my side. What a mamma’s boy. He seemed to be getting better – he ate some turkey lunch meat (the only thing he would eat) and drank some water. He even hopped on the bed, which surprised me given his lack of energy. He is back to eating and drinking as I type this, but I’m planning to take him to the vet first thing in the morning, just to answer our questions and calm our fears. Poor puppy…the worst thing is they can never tell us what is wrong =( I wish dogs could talk…I think they would give us some very interesting insights. Teddy is in my prayers and Dexter will put up a doggy prayer for him too! Poor puppy! I hope everything works out.